Roland's diminutive hybrid synthesizer, the JD-Xi, is now available in a limited edition silver and white livery while stocks last. Ditching the very fingerprint-revealing black, Roland has opted for a white and silver treatment whilst retaining the red LEDs and display. Although the red halo around each of the knobs has been ditched in favour of a more subdued look. The news comes just a week after DJ Hardwell showed off his very special white JD-XA (no doubt to fit in with his extremely white new studio), but it doesn't look like Roland will be bringing this particular version to market anytime soon. Shame. 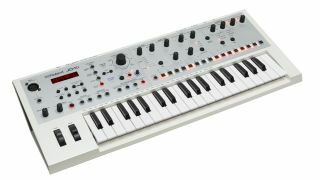 For more information on the synth and where to buy visit the Roland website.